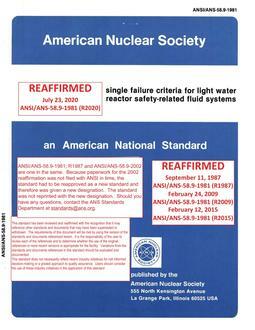 This standard provides design criteria for systems that perform the safety-related functions necessary to shut down a reactor and maintain it in a safe shutdown condition for selected design-basis events, i.e., any design-basis events that do not require operation of engineered safety features. For design-basis events that require operation of engineered safety features, this standard can be selectively applied because of plant features specifically designed for these conditions. For systems that serve multiple functions, the design criteria associated with the most limiting function shall be applied. The following safety-related functions are required for safe shutdown and are addressed in this standard (1) reactor core reactivity control, (2) reactor core heat removal, (3) reactor coolant pressure boundary integrity provided by (a) temperature control, (b) pressure control, and (c) inventory control.